My interview with Robert Sherman's son Robbie Sherman did. Robbie recently edited and published his late father's memoir Moose: Chapters From My Life. 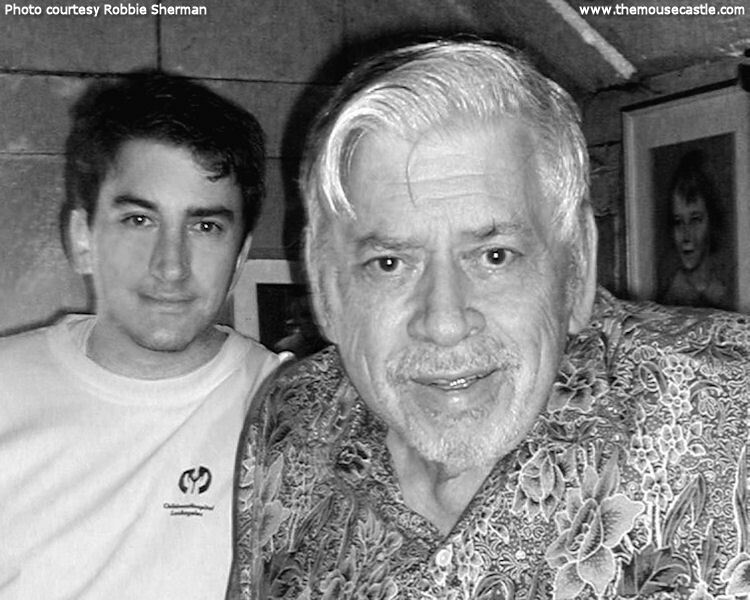 The book is a wonderful telling of episodes in Robert Sherman's life from his harrowing service during World War II (a battle wound would force him to walk with a cane for the rest of his life) to his award-winning success at Disney writing songs with his brother Richard. The Sherman Brothers songbook makes up a big chunk of the soundtrack of your life if you have any appreciation for Disney: Chim Chim Cheree, Winnie the Pooh, It's a Small World, Step in Time, Fortuosity, Feed the Birds, A Spoonful of Sugar. Outside of Disney, their output was just as impressive, writing song scores for Chitty Chitty Bang Bang, Snoopy Come Home, Tom Sawyer, The Slipper and the Rose, Charlotte's Web and others. A Sherman Brothers song adheres to the basic concept that Robert and Richard learned from their songwriting father Al Sherman. It's always singable, simple and sincere. 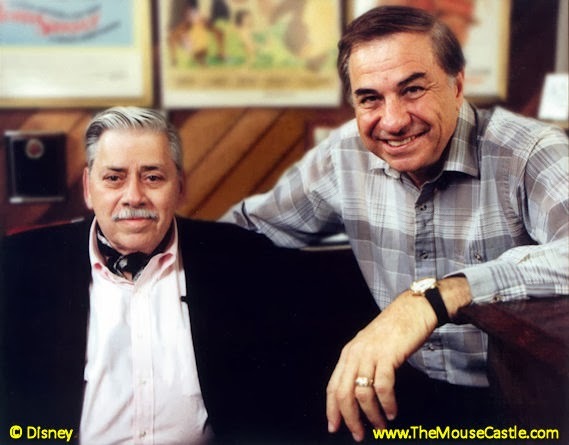 In my conversation with Robbie, we talk about his dad, the Sherman Brothers, and the odyssey it took to bring Moose to print. We also discuss the 2009 documentary co-directed by his brother Jeff Sherman and his cousin Gregg Sherman, The Boys: The Sherman Brothers Story. And here's where it gets really interesting. I've long admired and been touched by The Boys, a bittersweet film that, while celebrating the joys of Sherman Brothers music, also laments the strained and sometimes distant personal relationship between Richard and Robert. It's a relationship, Robbie says, that didn't exist. Any conflict or feud, he insists, was fabricated by his brother and cousin to make The Boys a more dramatic film. He feels his father wasn't portrayed fairly and takes Jeff, Gregg and Richard Sherman to task for it. This, as you would expect, has caused even more conflict in the family, which Robbie talks about in detail. Give a listen to today's show and let me know what you think. About Robbie Sherman. About the Sherman Brothers. About Moose and The Boys. Call The Mouse Castle Lounge Listener Line at (702) 475-5625 or please leave a comment below. I'm not sure WHAT to think. I heard about this "conflict" between the Sherman Brothers years before the film "The Boys" was made. And I heard it from folks who knew them well and worked with them. The conflict was never specified, per se, only that it existed on a personal level. So, for it to have been made up by Jeffrey and Gregg seems implausible. It's understandable that there may have been some overstating and such for dramatic purposes of the film. That sort of thing happens a lot. And I can understand how Robert himself, as well as Robbie could feel that the film doesn't portray as accurate a portrait as it could have. Very puzzling. I would say that people should definitely read MOOSE. It is a fascinating look at Robert Sherman, who up until now, I think many of us really didn't know very well. Gregory Wright, I tend to share the same feelings you have about that conflict! Whatever that means! ;-) I don't think that was made up by Jeffrey, Gregg and Richard at all! Now, since it's none of our business, I believe the "conflict" might have been left out for good!